Time for a recap of my favorite music from the past year. I decided to make two lists: one for my top ten favorite albums, and one for top ten favorite songs (outside of those on the albums). For the first time in many years, I enjoyed numerous singles where the corresponding albums didn’t impress me nearly as much. I felt like I had to represent those fairly. 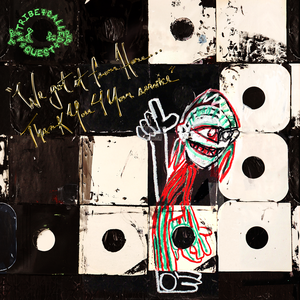 A Tribe Called Quest – We Got It From Here… Thank You 4 Your Service – A pretty much perfect comeback album from a legendary act. Coming 18 years after the tepid Love Movement album, it was hard to know what to expect. What they deliver is denser, a shade darker and more political than before, but with the same Native Tongues ethos. This album marks the last time we’ll hear the classic dynamic between primary emcees Q-Tip and Phife Dawg (RIP), who are on point as always. Because of Phife’s passing, we get a taste of little-heard Jarobi on the mic (who manages to hold his own). Guests range from old friends (Busta Rhymes), similarly eclectic artists (Andre 3000), and young admirers (Kendrick Lamar). They all contribute, but each song is clearly a Tribe joint. With Ali Shaheed Mohammed unavailable, the production is mainly handled by Q-Tip who does a fine job of crate digging for unusual samples to loop and layer over sturdy hip-hop beats. Occasionally the samples get too random and cluttered, and on some tracks Phife relies too much on his Trinidadian patois, but this album is among the group’s best work, only surpassed by unassailable golden-age hip hop classics Low End Theory and Midnight Marauders. Cymbals Eat Guitars – Pretty Years – Like many of their contemporaries (e.g. The Hold Steady, The War On Drugs) have already done, Cymbals Eat Guitars bring classic rock influences to bear on their 4th album. That is evident just from the song title references to Bruce Springsteen (“4th Of July, Philadelphia (Sandy)”), and Led Zeppelin (“Dancing Days”). Musically, the tempos are slower and the melodies more pronounced than on previous albums. The use of synth, piano, and occasional brass flourishes keep the music firmly in indie-rock territory, but when the guitars come in, they are more assertive. What makes the album truly special is how the slower building tunes amplify the songs, which are powerful meditations on the possibilities of love, the pain of loss, and dealing with anger and violence. Their best album ever, and the finest indie rock of the year. The Range – Potential – Brooklyn-based producer James Hinton’s second album as The Range is a testament to the power of listening. The vocal samples woven and layered into his instrumental hip-hop, dubstep, and electro-pop are taken from random people singing and rapping on YouTube. The magic is in his recognition of the the emotional power in many of these seemingly ordinary snippets and his ability to re-contextualize them and build amazing songs around them. Even without knowing the concept behind the songs, it’s a fantastic listen; Hinton appears to have been motivated by the concept to produce some of his most memorable music. He even gave the sources of his YouTube samples a share of his publishing! Day Wave – Headcase / Hard To Read – This combination of two EPs produces a pretty awesome indie-pop album. Day Wave a.k.a. Jackson Philips has a knack for subtle, melodic songs that can both entrance you in a moment and really stick with you long term. Similar instrumentation and tempo can occasionally make the songs blend together, but he’s just such songwriting talent. Day Wave has released a couple of other singles and EPs well worth tracking down, but this release is the best place to start understanding the magic of Day Wave. Broods – Conscious – A talented brother-sister, synth-pop duo from New Zealand continue to expand their reach on their second album. Georgia Nott provides the breathy, emotive vocals and older brother Caleb Nott provides a lush electronic backdrop with elements of trip-hop and indie-pop integrated into the electronica. All of the songs are extremely well arranged, but the best ones are where Georgia’s vocals reach their peak. When she sings “heartlines” so it sounds like “hurtlines”, it’s something special. Look forward to more from Broods. Empty Houses – Daydream – Forget the punchy, tastefully retro, Motown-girl-group-by-way-of-Amy-Winehouse sound of this album. It’s all about the songs. It’s rare to find such consistently well-written songs arranged and performed so skillfully. Combined with the expressive and powerful vocals of Ali Shea, they lift the album far above being a mere genre exercise. Timeless and irresistible after just a couple of spins. Moving Units – Damage With Care – Well over a decade has passed since Moving Units released their self-titled debut EP featuring “Between Us & Them”, an impressive opening salvo that portended greatness in the nascent dance-punk scene. But after a promising debut album which reprised that song, the band released a couple of decent, but lesser, follow-ups and finally split in 2012. Given the decline of the dance-punk scene that spawned them, it seemed unlikely we’d see new music from them. But here it is in 2016 and a new lineup built around founder Blake Miller released perhaps their best music since the debut. They band sounds fresh and energized. A must listen for dance-punk fans. Pr0files –Jurassic Technologie– A few years ago, the soundtrack to the movie Drive along with the stable of artists on producer Johnny Jewel’s Italians Do It Better label (Chromatics, Glass Candy, etc.) made 80s-style synths cool again. This spawned a whole slew of ‘synth-wave’ revivalists. Many of the artists produced instrumentals that sounded like mediocre music from video games. It’s far too easy for synthesizers to sound cheesy. Danny Sternbaum of Pr0files has clearly learned his lessons from Johnny Jewel well. He has a way with a dark synth-pop hook. Vocalist Lauren Pardini has as a powerful a voice as you will find in the synth-wave scene. Together as Pr0files, they’ve written a batch of impressive songs. If you liked the Drive soundtrack, any of Johnny Jewel’s projects, or edgy synth-pop in general, you owe it to yourself to check this out. A great article about this underrated album is here. Operators – Blue Wave – Operators, the synth-centric side project of Wolf Parade’s Dan Boeckner, merges Cold War era feelings of malaise and dread with paranoia about the prospect of an Orwellian society. These are not easy feelings to express in a pop music format. The trick is turning the songs into danceable pieces of art that even Big Brother could appreciate. The chilly synths and discordant vocals can sometimes make the songs sound like half remembered dreams, but they set a distinct mood and the tension is not always released. If you like The Faint, definitely check these guys out. Timecop1983 – Lovers (Part 1) EP – The very best of what the synth-wave scene spawned. Young, talented artists getting interested in 1980s style synthesizer music and making it their own. Dutch artist Timecop1983 (a.k.a. Jordy Leenaerts) is amazingly skilled at making the cold sounds of the synthesizer burst with the warmest arrays of human emotion. Sure it’s unabashedly retro. But even without vocals, the songs are gorgeous. When paired with sympathetic vocals, the songs truly soar. Lovers (Part 1) is merely an entry point into an already deep catalog that stretches back several albums and 3 years. Previous albums Journeys (2014) and Reflections (2015) are stunning. If you have any interest in 80s style pop or even just pop in general, check out Timecop1983. Entire albums are available to listen on YouTube (links below), but if you like his stuff support the artist on Bandcamp!